After a week of setbacks to his campaign (Biden’s gaffe of the week and the miserable debate performance), President Barack Obama woke up to a 7.8% unemployment rate, a gift to his campaign to be sure. This rate is the lowest it has been since Obama took office. But, is this 7.8% unemployment accurate and do average Americans benefit? The answer is no, not really. Curb your enthusiasm over the surprise 0.3 percentage point drop in September’s unemployment rate, to 7.8%. It was largely because of a surge in the number of part-time workers who would really rather have (or need) full-time jobs. According to the survey of households, from which the jobless rate is derived, 873,000 people found jobs last month–which is a huge gain. But, according to the Bureau of Labor Statistics, 600,000 of those workers settled for part-time employment for economic reasons, not by choice. The fact remains that one year ago when we had 9% unemployment, we actually had 2,680,000 more Americans in the labor force. Essentially, that means that over 2.5 million workers have given up looking for work since last year. If we break it down by gender, that’s 711,000 men who have exited the workforce and, amazingly, over 1.9 million women who have exited the workforce, according to the Bureau of Labor Statistics. And, Rommey is right. The chart below from the Bureau of Labor Statistics shows that the “Labor Participation Rate” is just about the lowest it’s been in 10 years. As a Colorado blog, we must point out that the CO unemployment rate is 8.2% and seven counties in Colorado have real unemployment hitting 20%. 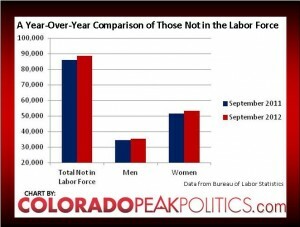 Coloradans know nothing of a statistical sleight of hand improvement in unemployment. 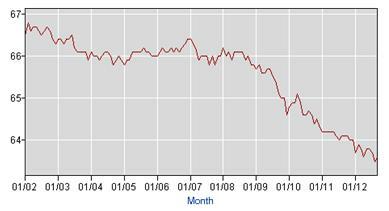 Color us skeptical, but if this is what recovery looks like, we would hate to see a “recession”. This hardly seems cause for celebration. Low labor participation rates do not an “American Dream” make. I put a chart together showing the Labor Force Participation Rate as compared to unemployment… You can view it at the link on this photo.